Reading Library explores the physical and spiritual relationship between readers and books. While reading, we physically interact with a book, opening its cover, holding its body with hands, looking at letters and images, turning pages, hearing paper sounds, and even smelling the paper. Once we start to engage the text, however, its physicality, such as its weight, size, or letter font, disappears and what remains is the metaphysical existing only in the mind. I distilled found books and reshaped them into irregular shapes, “books/stones.” The absence of the original form intensifies its physicality. 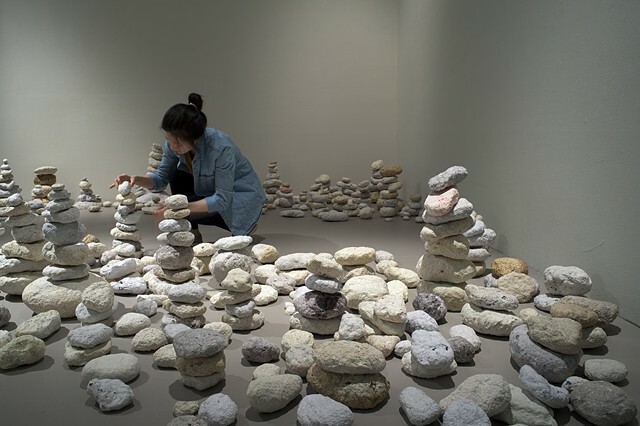 Inspired by the ritual of piling-up wishing stones, in which common objects take on a spirituality, Reading Library invites people to stack the books/stones. The books/stones begin as a metaphor of the physical and transform into a metaphor for the spiritual by the audience’s act of piling them up.